FightMetric's inaugural Strength in Numbers campaign for 2013 concluded with UFC 168. We pledged to donate $5 for every minute UFC fighters spent competing in the Octagon. In total, 2013 saw 4,014 minutes, 9 seconds of Octagon time, a new UFC record for a single year. 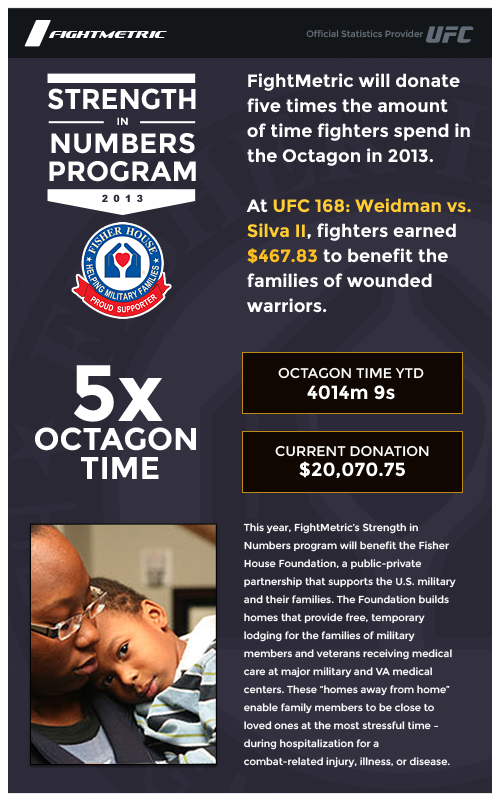 That means FightMetric will donate $20,070.75 to the Fisher House Foundation to benefit the families of wounded warriors. We look forward to continuing the campaign in 2014 to raise even more money for charity. The longest event of the year, UFC on FUEL 7, raised $843.25. That event featured 10 of 12 fights going at least 15 minutes and clocked in at a total of 168 minutes, 39 seconds. The year's quickest event was Fight Night 32: Belfort vs. Henderson, which only raised $322.00. Seven of the 11 fights that night finished in the first round and only two went the distance. The whole thing was over in 64 minutes, 24 seconds. On the low end, Dave Herman had the shortest year in the UFC, raising $1.41 for 17 seconds of work. Rony Jason had the quickest combined two fights, with a total of two minutes, four seconds, resulting in $10.33. And Gabriel Gonzaga fought four times in 2013 and only managed 9 minutes, 2 seconds of fight time. He was one of only six fighters to compete four times this year and the only one to spend less than a half hour in the Octagon.